Team Scary Potter and the Hauntwarts Express reviewed this attraction on October 7, 2017. Some times a discerning haunt-go’er needs a little more out of a scary attraction. Oh sure, hidden gremlins in dark hallways lurching forward as unsuspecting patrons amble by to declare “Boo!” is a timeless method by which to inflate neck hairs and twist intestines. Some times, though, a fella just wants more. Enter Darkview, a haunted attraction of a different ilk. Featuring longer, interactive scares and actors offering more than just a glance in the dark, the cast of Darkview are ready, and very willing, to provide that extra touch of interactive, quality time to frighten and entertain each and every customer brave enough to enter their attraction. Everyone likes a little extra attention, right? Interactivity is the order of the day at Darkview. Though still possessing a healthy dose of startle-actors and a brooder or two, Darkview’s company are mostly comprised of the extended-interaction type. They can take many forms, but Darkview’s demented residents were excellent at offering highly-entertaining, prolonged interplay. As I outline in the Fright Factor write-up below, Darkview is equipped to offer characters ranging from homicidal to jubilant, and the representative portrayals were believable and intriguing. We only encountered one actor breaking character, as he (rudely and inaccurately) demanded that we move faster on two different occasions. Everyone else maintained their chosen veneers deftly. Largely, the best character interactions we encountered involved multiple actors working together, often adversarially. Of the darker-toned Darkviewians, a pair of violent duos in the farmhouse were quite good – ¾ of which being young haunters (doomed Gerald was a favorite, generous until the end as he offered his “medicine” to our group selflessly). Grandma Verna and Madame (don’t quote me on those names, though) were also stand-out cast members from the farmhouse, and the miner and swamp monster caught our attention amongst the various segments of the trail. The best interactions, though, came in the circus segment – first between Schizo and Smiles, and then later when the latter was paired with Toodles. Each of these characters was so distinctive and quirky as well as dedicated to their bombastic portrayals that their conversations with each other and us were some of the most entertaining exchanges that we’ve been a part of at a haunted attraction. That’s not to say that the rest of the carnies weren’t great, because they were : the enthusiastic first female clown, the “free kiss” clown, and the gal who took our photographs at the end were all excellent as well. We found that being especially courteous to that last one in particular had its own particular benefits. Wink. Darkview has such a great collection of talented performers this year that our only wish would be to have even more of them. Truly a remarkable display by all involved. Most of the characters scaring, entertaining, or hugging us (don’t ask questions) were humans; thus, a wide-range of complicated outfitting wasn’t required. With a few exceptions, the clowns received the most intricate make-up and looked really good. EVERY clown, honestly, looked great. Even the, um, minimalist sensibilities of the Smiling Clown matched his character quite well. In the farmhouse, Grandma Verna and the woman that we cast a spell with were the stand-outs. Most of the others didn’t need a whole lot of visual enhancement, as they were believable on their own. Along the trail portion, the Green Gilly Monster was a nice addition, boasting a full-bodied nature-turned-antagonist ensemble. …That last sentence really sounded like a Paris runway announcer didn’t it? I missed my calling. The attraction certainly stands out from its surroundings – the only source of light in an otherwise uniform, mundane landscape. Signage seemed hardly necessary, but was present – we had no trouble finding Darkview. A pair of spotters directed us to the parking lot, and the fun began. After a brief foray through the ticket line, we met our first line-haunter. Actually, it wasn’t immediately obvious that he was anything more than a decoration until he was slamming his fist against the metal shingles of the building in what we can only assume to be a colloquial greeting. Yes, the haunting began even before we had finished traversing the ticket booth. Several additional haunters were roaming the ground and waiting lines, including the first of many entertaining coupled-performances – this involving a rickety wheel barrel, and an imposing chap with an ax and some really bad razor burn. Of a slightly less sinister veneer, the ticket taker, George, by way of a slightly vulgar humorous anecdote or two, won our affections immediately. Despite his friendly repartee, it was impossible not to feel a little uneasy when speaking with him, observing the large, angry scar running down the side of his face… was George’s benevolent attitude meant only to soften us up and drop our guards? The main hub area featured a great deal of additional avenues for entertainment. A “last ride” style simulator was available as well as a newly-added carnival-style game, a hilariously macabre take on the classic “bankshot” contest. A movie screen played….well, I’m not exactly sure what it was playing, but it was disturbing – of that, I am certain. The path to the exit (or toilets) also included a separate building where Darkview Merchandise was sold. A 25-minute escape room is available as well. Improving upon last year’s iteration, this season’s brain-scrambler is much more difficult and complex, albeit still fair. Unfortunately, despite receiving clues aplenty, we were woefully inadequate of completing our task. I am currently writing this review as I shrivel away to nothingness within this accursed chamber, the busts of long-dead deer leering down at me. Sometimes they giggle, others they chide, but always they stare – merciless and cold. I have tried to reason, “I am a vegetarian! We are herbivoric brothers amidst a forest of flesh-peddlers; we must band together, friends!” Yet, I have received no reprieve. Their hollow eyes continue to bore into my soul. I am doomed. Everyone that we met at Darkview (which is an exhaustive list, honestly) was incredibly helpful, friendly, and kind – from the owners to Mr. Escape Room to the staff and actors to the gals running The Deadly Chew (the concession booth), Darkview has a fantastic assortment of folks involved in its operation this year. Our group purchased 2 grilled cheese/tomato soup combos (yes, at a haunt), 2 fries, 2 cheese fries, 4 boxes of popcorn, macaroni and cheese bites, and something like 18 brownies. Excluding all hyperbole : delicious. Eat, haunt and be merry, friends. It doesn’t get any better than this. One does not arrive at Darkview in anticipation of a Little Princess Tea Party. The facade that we witnessed as we drove into the complex was dark and foreboding. Wait, back that up a step, and allow me to rephrase : the drive TO the facade we witnessed as we drove was dark and foreboding. Darkview is located directly at the center of Scary Countryside, USA, at the intersection of Creepy Switchback and Eerie Cornfield. Our haunt-glands were already slick and dripping by the time we reached the property. With sound playing such an impressive role in the attraction itself (see Special Effects below), it wasn’t particularly shocking that the parking lot, ticketing line, and concourse were equally aurally-satisfying. From the natural and commonplace (cricket sounds) to manufactured discomfort (creepy Appalachian music), the entire area leading up to the attraction was properly outfitted with mood-establishing soundtracking. The main concourse is awash in lingering fog and dreary lighting and could, were it so-motivated, function as a haunt itself. This ambiance leads right up to the attraction’s entryway : the creepily-designed, boarded-up, farmhouse. The whole scene is more than a bit surreal, the template for a future, potential nightmare, waiting to be subconsciously-constructed. Without question, Darkview’s greatest effects are the subtleties – the underlying essential constituents that work together to establish atmosphere and ambiance. Nearly every section of the attraction (and external grounds as well) is accompanied by an effective, haunting soundtrack. In the house, classically foreboding, within the circus, jauntily festive, the quality of our interactions and the scenes themselves were aided by these strong musical cues. Hand-in-hand with a compelling score, light effects were varied and potent, enhancing the environment through every landscape. Atop that foundation, set design was greatly improved this year, particularly in the cemetery segment and inside the farmhouse. The mausoleum area, overlaid with a thin sheen of fog and dim lighting, looked great. The farmhouse was uniformly well-detailed, with each room rightly filled with props and set pieces. Though a bit of a different order of “set design,” the bathroom was unique and cleverly constructed. The Darkview version of this year’s popular swamp design was very realistic as well. The “hallway of doors” and mine elevator effect sequences returned to our delight, but, as it turned out, our two favorite effects were featured in the first two rooms of our journey (see Fright Effect below), and were, perhaps, the creepiest moments that we encountered in the farmhouse. A really creepy ghostly apparition, an unexpected serpent, and a unique vinyl maze were also very enjoyable. The trail/circus were much lighter on set design and effects, being almost completely actor-focused, but did feature a very realistic blood saw blade, and perhaps the most disgusting body bags that we’ve ever seen. A particularly distraught country gentleman’s affection for his grandmother, though, touching, did end in a very unique effect as well. Our…MY least favorite effect was the airshooter in the farmhouse that blasted me, with startling, precise accuracy… directly in my man-parts. There is audio of the event in question, and it will be made available to the public at large over my dead body. 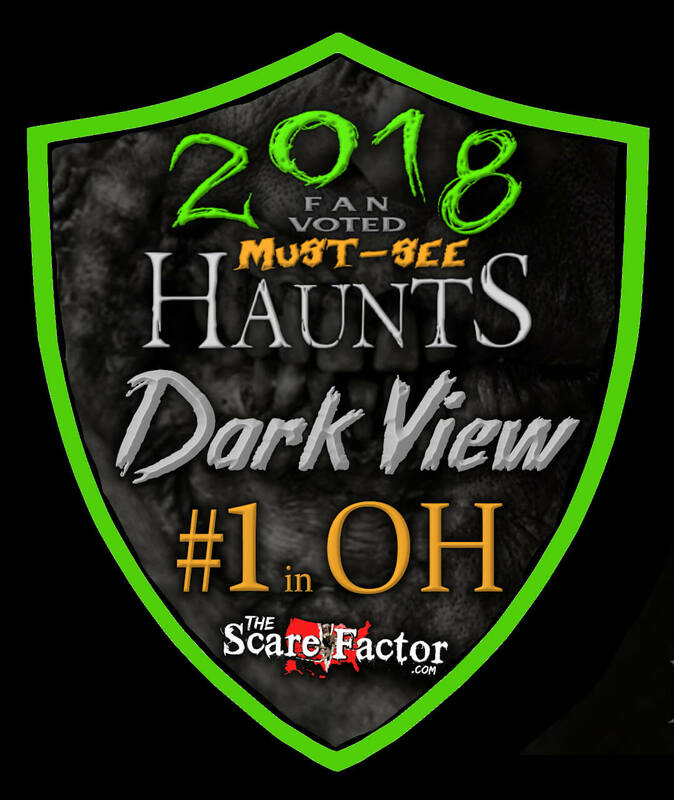 The owners of Darkview have divided the attraction into 5 or 6 individually-named segments, but for this category, it’s really more appropriate to dichotomize the entire haunt along one key feature – the scary vs the hilarious. I’ve had similar versions of the same conversation many times over the years, including as a monologue within my reviews. As with all things, I can be pretty wordy, but it all comes down to this principle : haunts don’t need to be scary, they need to entertain. Obviously scaring is a form of entertainment, and the most common form used by haunted attractions (duh), but it’s not the only avenue by which a haunted attraction should be weighed to determine its quality. Interestingly, Darkview finds itself on both sides of the divide at different points of its attraction. It begins with a more traditional tone : a newly-added introduction (as presented by a very imposing animatronic within a self-contained, hazy vine room), followed by an even more chilling, effect-laden exchange within the farmhouse-proper (benevolent spirits battling a malevolent, demonic presence to save our souls) pushes the heebee-geeby-counter to a fever pitch. The remainder of the farmhouse wobbles toward the other side of the spectrum a few times, but mostly continues narrowly down the path of the damned – serpents bursting forth, anguished howls from boo-scarers, and many interactive scenes with circumstances working out poorly for the less-malicious participants. The farmhouse had a healthy amount of ineffective startle-attempts last season that have been thankfully removed. The resulting effect this season is a much leaner, more effectively horrifying experience. The cemetery/trail portion is a bit of a tamed down version of the farmhouse, featuring some audio scares, a few extended scenes (the take on Michael Meyers was unique), and a handful of actors rising out of the darkness to offer their ill-tidings. Though much better than last season, it still doesn’t quite pack the punch of the farmhouse, unfortunately. The attraction could have ended there and would still have accounted for a well-spent Saturday night, but the best it seemed was still to come. As this is the “Fright Effect” category, the discussion can largely end here. Don’t misunderstand – the circus folk are certainly CREEPY in their own idiosyncratic ways, and to a lot of people, that last stretch is probably the most unnerving segment of the entire attraction, but for us, the pendulum had swung completely around, and Darkview had altered squarely into (intentional) hilarity. A few shocks remained – good ones in fact (keep in mind that a simple photo op is never quite so simple at Darkview) – but our memories of the last 10 minutes or so of our trip through the haunt are mostly comprised of soggy-eyed, jelly-bellied laughter. Overall, Darkview is not the scariest attraction we’ve visited in recent memory, but it is absolutely one of the most entertaining, and that’s a lot more important. We spent 32 minutes in the attraction from an $18 ticket, placing the minutes of entertainment per dollar spent at 1.78. Of important note : a coupon is available through Darkview’s website that offers a 5 dollar discount on Fridays and 3 dollars off Saturdays, which makes for an even better value. We were quite impressed with our first visit to Darkview last season, but this year’s improvements and cast really blew us away. What began as a spooky, effects-heavy creep-fest transitioned into a flamboyant laugh-a-thon by the end, and we are so thankful to have taken the ride. The impressive escape room ($10), and absurdly delicious feast that we experienced thereafter were cake icing spread across an already masterful culinary concoction. 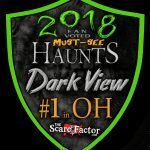 Darkview is a must-visit haunted attraction this season, and we strongly urge any lover of Halloween, spook houses, or just having a great time with friends on Saturday night to head out to Toronto, Ohio and see for yourselves.